Flood protection information for Knox County residents…. Why does it flood in Knox County? Flooding is a natural condition of rivers, streams and creeks. Flooding in Knox County is usually due to the land’s inability to soak up rainfall from a heavy rain event. This can be a result of compacted soils, an abundance of built surfaces that do not absorb rainwater, a blocked storm drain, or any combination of the above. Floodplains are the areas of land directly adjacent to waterways where the water naturally flows when it overtops the creek banks. Floodplains are Mother Nature’s way of managing water during and just after heavy rain events. If structures are located in a floodplain, it’s likely that they will experience flooding at some point. A floodway is the channel of the waterway and the adjacent land that the waterway needs to discharge flood waters without increasing the elevation of the water more than one foot. This area will experience flooding during heavy rain events. No buildings are permitted within the floodway in Knox County. Knox County also enforces the No Fill boundary as shown on the map. Sinkholes can back up with stormwater runoff, which can cause more long-term flooding conditions unless or until the clog is removed. Knox County has adopted a policy limiting development around sinkholes in an effort to prevent future damage to structures. I live or have a structure in a floodplain. What can I do to protect my structure from flooding? It is possible to elevate non-residential structures in the floodplain. This practice should only be done by a licensed engineer. Homeowners’ insurance rarely covers damage from floods. You may need to discuss a flood insurance policy with your insurance agent. Knox County participates in the National Flood Insurance Program, making flood insurance both available and affordable in Knox County. This insurance is backed by the federal government and is available to all structures, even those that have previously been flooded. Be sure to check your policy amount every few years to make sure that you have enough coverage for the contents of your structure. How do I protect my structure from future flooding events? If you anticipate a flood, turn off the electricity and gas and move valuable to an upper level. Create a detailed checklist of valuable items to relocate for times when heavy rains are forecasted. Wind damage often accompanies large storms, and may exacerbate flooding problems. Manage tall trees around your structure to protect it in the event of strong winds. I am experiencing flooding on my property right now. What do I do? If you are experiencing flooding in your home and are in need of emergency assistance please call 911. For non-life threatening flooding issues, the Knox County Stormwater Department will evaluate your flooding issue and offer a solution if possible. Visit our Flooding & Drainage Issues page for immediate help or to report a drainage or erosion concern on private property. My sewers back up into my basement every time there is a heavy rain. Advice? A standpipe is an easy solution to this problem if you have an unfinished basement and if the water doesn’t rise to more than 2 feet in the basement. For deeper sewer backup flooding, talk to a plumber about a backup valve or other options. What will Knox County do to protect my structure from flooding? If you are located in a floodplain, Knox County can provide more specific information on your structure and property, such as depth of flooding over a building’s first floor and information on past flooding problems in the area. I would like to build in the floodplain. Can I do this? The Knox County Flood Damage Prevention Ordinance regulates development in and around Knox County. Compliance with the policies in this ordinance is required for floodplain development. 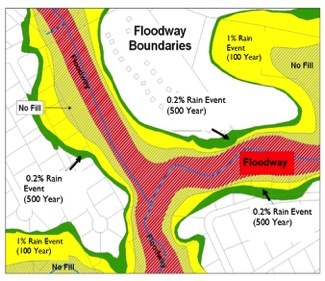 A floodplain development permit must be obtained if the proposed development/building is within the outer half of the 1% / 100-year floodplain and/or the 0.2% / 500-year floodplain. FEMA regulations restrict any development in the red area shown in the map example above. Knox County regulations go a step further in protecting residents from potential flooding by restricting development in the light green hatched area of the above map. The Federal Emergency Management Association (FEMA) requires new buildings’ minimum floor elevation (MFE) to be built one foot (1’) above the 1% /100-year flood elevation. Knox County provides additional protection from potential flooding by requiring new buildings’ minimum floor elevation (MFE) to be one foot (1’) above the 0.2% / 500-year flood elevation. An Elevation Certificate is also required by the Knox County Stormwater Management Department for these developments/buildings that are required to obtain a Floodplain Development Permit (see above), as part of our National Flood Insurance Program participation. What can I do to help prevent flooding in Knox County in general? Don’t dump anything into streams, ditches, storm drains or sinkholes. Not only is it against the law, it’s contributing to localized flooding and water pollution. This includes yard debris and grass clippings. Do not block storm drains. Clean debris and trash from storm drains near your property as needed. If you live near a ditch or stream, keep it clear of yard debris and trash. Allow native vegetation to grow up along the banks of the stream – vegetation soaks up water and the roots hold the soil in place. Drowning is the number one cause of flood-related deaths, mostly during flash floods. Even as little as six inches of flowing water can knock you off your feet! Use a pole or stick to test the water level before you venture out into it. Electrocution is the number two cause of flood-related deaths, behind drowning. Electrical currents can travel through water. Report downed power lines to 911. Gas leaks can accompany floods. Use a flashlight to inspect for damage to gas lines. Do not use candles, lanterns or open flames unless you know the gas has been turned off and the area has been ventilated. More people drown in their cars than anywhere else. Do not drive around road barriers as the road or bridge may be washed out behind the barrier. Have your electricity turned off by your local electrical utility provider. Some appliances, such as TVs, keep an electrical charge even after they’ve been unplugged. Do not use flooded appliances or motors unless they have been taken apart, cleaned and dried. Small animals that have been flooded out of their homes may seek shelter in yours. Use a pole or stick to poke and turn things over, and to scare away small animals. After a flood, the ground and floors are covered with debris, including broken bottles and nails. Floors and stairs that have been covered with mud or water can be very slippery. Knox County works with local and federal Emergency Management Agencies to address flooding and floodplain development in Knox County. 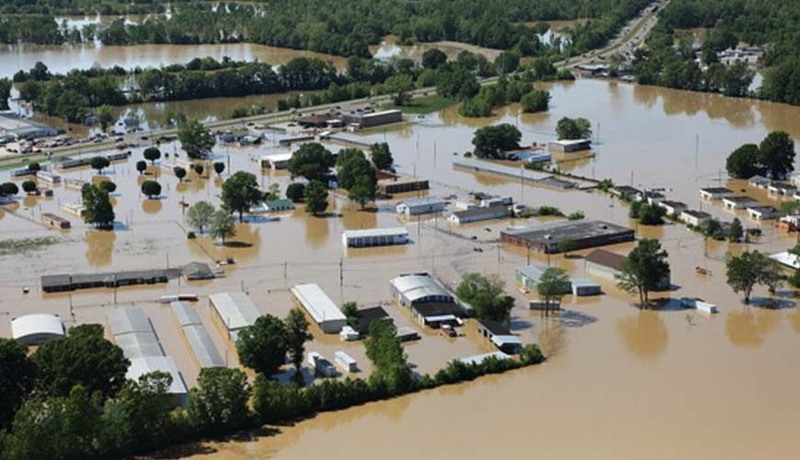 Click on the boxes below to learn more about Knox County’s response to flooding and requirements for floodplain development.